Solar cells are semiconductor structures that convert solar radiation (sometimes called solar energy) over a wide wavelength range, into electricity. Solar cell itself is composed of a number of diodes, pn junction, which work in the fourth quadrant of the I-V output characteristic. Photovoltaic conversion generates electron-hole pair under the influence of incident light, the photon energy is sufficient to move electrons from the valence band into the conductive zone. 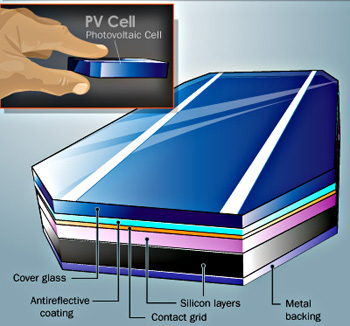 Solar cells can be connected in series, parallel, or in combination, it all depends on the projected power of connected cells – solar panel. Voltage which is obtained at the output depends on the type of cells and can be 0.3-0.7V, the current density is about several tens of mA/cm2 depending on the strength of solar radiation, but also of the spectrum of radiation. So, it works in direct mode, but with a negative current direction ID, Figure 1a. 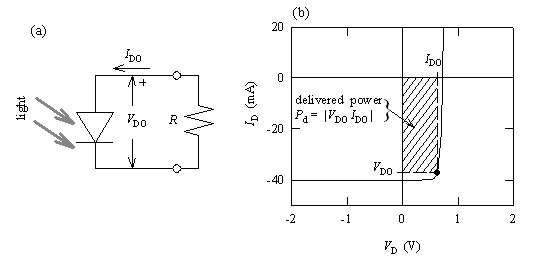 In Figure 1b clearly shows a negative sign diode current ID. According to the material they are divided into Si, GaAs, CIS, CdTe, INP, organic, etc. Number of pn junctions may not be one. Today is being developed solar cells with three or four pn junctions with a higher coefficient of efficiency (mainly are based on GaAs and Ge). In addition, there is another classification according to the type of material entering in the building of solar cell, where “n” is the type of material with one and “p” with another type of forbidden zone Eg. These are called heterostructures, and mostly cells with multiple pn junction. In this way it is provided better coverage of the wave absorption spectrum of incident light. In recent years very much money has been invested in silicon hetero-cells (SANYO solar cells and solar panels). Figure 3 provides an overview of the cell the efficiency and depending on cost per Wp and technologies. Although, there is a large price range, all types are exploited. It can be expected drop in the price of power ($ / Wp). Silicon solar cells are commercially the most common, and are divided according to the crystal structure: monocrystalline, polycrystalline and amorphous. Monocrystalline solar cells are expensive but their efficiency ratio is up to 18%, 15% for polycrystalline which represents an alternative (although the technology is completely different). Amorphous solar cells (better solar panels) have the lowest efficiency of only 8% in value, but their price is the lowest. Amorphous silicon is suitable for use on various materials with variable surface (for instance, applied to the plastic film). 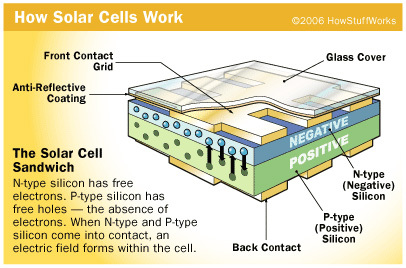 The cross-section of a typical solar cell of any type was shown in Figure 4 (taken silicon solar cells for example in solar panels). The first layer is the protective glass that is SiO2, which protects the cell from external influence. Below is an anti-reflective layer that reduces reflection of the light and provides more energy to reach the semiconductor (increased use of cell). Also, there is a system of transparent electrodes, TCO, which contact the semiconductor pn junction in abstraction is made of a photon of sunlight. On the bottom is the last contact-bonding layer. The maximum output voltage of individual solar cells is about 600-700mV, and the serial cells connection obtains the desireded voltage. The most common is about 36 serial connected cells forming PV module (solar panel) with nominal voltage of 12V because the electricity produced by one solar cell is relatively small. So that, the practice is multiple solar cells together in a group which forms a photovoltaic module. According to the projected power of the PV module, the connection in series and / or in parallel is obtained, which produces electricity, voltage and power much greater intensity.